1) The arctic circle is experiencing a heat wave, over 32 degrees. 2) Los Angeles has had only one rain event in 365 days, and that netted .3". This is data coming from a scientist I've recently started following on twitter. 3) California's almond crop is in danger from freezes. 4) Early spring is expected in Washington DC. 5) Record warmth for the east coast, after an extremely tough and cold winter. In our own experience, this winter has been crazier than usual. Firstly we got hardly any rain - Martinez (north of here), before our 'big' storm yesterday (more on that in a minute), had amassed only 7 inches according to the Contra Costa County Flood Control Dep't. In early February, we had a strange heat wave, with two weeks of soaring temperatures - it was 85 here in our yard one of those days. You know what happens when we get an early heat wave like that - everything starts blooming. Pears, plums, peaches, almonds - everything put on buds during that period and started to bloom. Then late February arrived, with below-freezing temperatures, very unusual for this area (our last frost date is February 15th). We had one morning of 28 degrees, several others of 30. This is also extremely unusual for us. Even my teenaged kids went out and played in it (as much as teenagers can allow themselves to 'play') and took pictures. 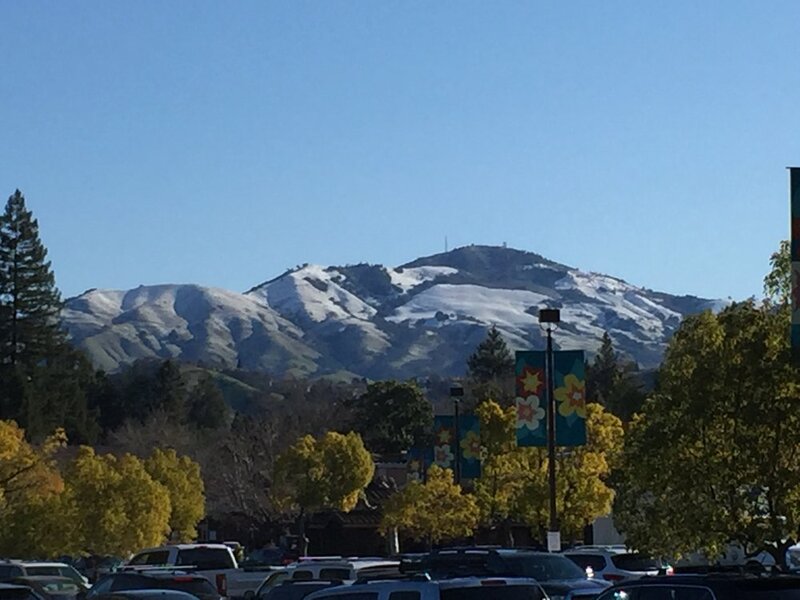 And this morning, on my trip to the post office, I was not surprised to see snow on Mt. Diablo, which usually happens a couple of times a year, but in December or January, never this late. I swear, when that hail started, my first thought was "oh no, the wheat!" and when I texted Tom that it was hailing, he texted back, "oh no, the wheat!" So far it seems ok this morning, but my goodness, it really brings home how hard it is for people who make their living growing crops, and how their entire yearly income can be destroyed by one weather event. I have serious respect for farmers, who constantly experience what it's like to sometimes have zero control over outcomes. Seems to me that climate change is beyond obvious, and it always surprises me when certain folks deny that it's happening. I really feel that it is time to start thinking and planning for the future - the near future - when it becomes even more extreme. Do you agree? If so, in what ways are you preparing? Meanwhile, a reminder about native bees. Even though we all love mulch (and there's lots of reasons to love mulch! ), remember to leave some areas of your yard uncovered. This allows our native bees to make their nests and raise their young, underground. Before this cold snap, I noticed a lot of native bee activity, so they'll be emerging for good soon. Also, leaving a little dish of water out for pollinators is helpful; make sure it's shallow, and put some rocks, broken pottery, or sticks in it so that the bees don't drown. If you're worried about mosquitos, just change out the water every 1-2 days (and throw the old water in the garden somewhere - in other words, don't waste it). And speaking of emerging creatures, Vector Control recommends putting out yellow jacket traps around now, to try and catch the queens before they lay babies. I find that this brand is the only one that really works. Now I'm off to do some homework. I have one class that requires me to memorize 250 trees by Latin and common names, and family names. Spelling is crucial. I can definitely feel my brain working hard when I'm studying these trees. Hopefully the knowledge will stick for the rest of my life, and I'll be an ace at identifying both native and imported trees!